There’s no doubt about it; in the current gaming climate, competitive online gameplay is the talk of the town. The ever-growing Switch library of games boasts a fair share of titles that offer awesome online goodness - whether it’s spending three frantic minutes inking turf in Splatoon 2 or praying that a blue shell isn’t thrust your way on the last lap of Mario Kart 8 Deluxe. But when it comes to true, good old-fashioned couch co-op game, the search to find a compelling piece of software becomes somewhat of a challenge. Enter Pode from developer Henchman & Goon, a small Norwegian team that wants to remind players that multiplayer video games can be just as much fun while being relaxing, tranquil and comfortably cooperative. 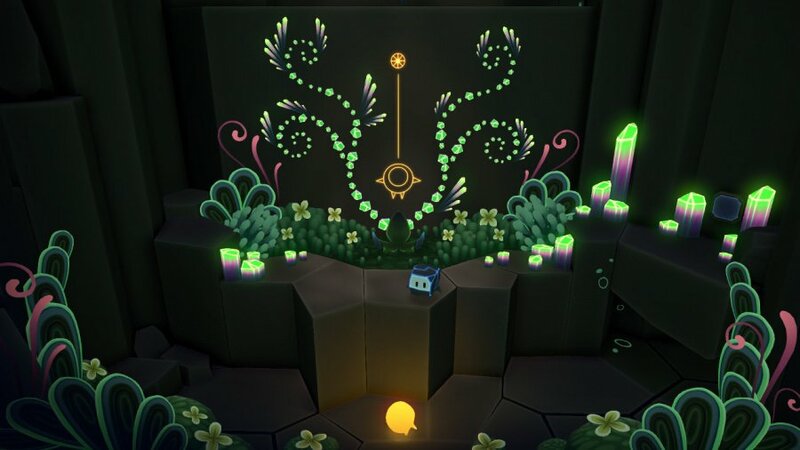 You see, Pode is a game built around the themes of friendship and teamwork and believe us when we say this: Pode is best played with someone by your side. You take control of Glo and Bulder, a fallen star and a rock, and embark on a mystical (and often emotional) journey to help Glo return home. With their distinct abilities, it’s up to the player to exercise their unique traits to overcome a bunch of challenging puzzles all while being reminded that working as part of a team is paramount to success. 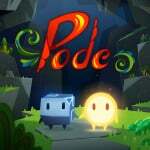 Much like the ingenious Snipperclips and Death Squared, Pode is a title with cooperation proudly sitting at its core – a welcome theme that doesn’t ease up from start to finish. Each and everyone of its carefully placed puzzles is tackled by utilising good teamwork and effective communication. With Glo having the ability to bring life to dormant wildlife with a squeeze of ‘ZR’, flowery ledges, colourful springing platforms and other useful fauna are brought to life in astounding and beautiful detail. Glo is also much lighter that Bulder and has means of tiptoeing across water and floating down to hard-to-reach platforms. Bulder, on the other hand, is much heavier and can manoeuvre (and even swallow) rocks, press down switches and ‘grow’ additional means to traverse across the terrain. Having two small, but hugely contrasting sets of abilities at your fingertips makes way for some truly mind-bending puzzles. 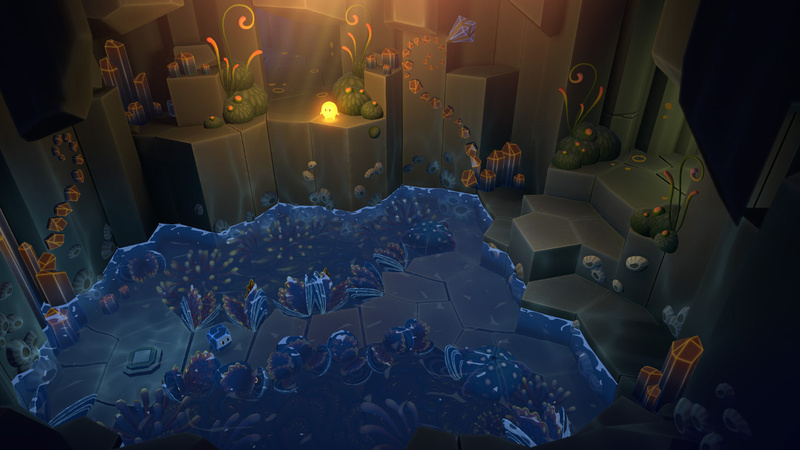 In one instance, Glo carries Bulder across a pool of deep water for Bulder to inhale a glowing stone that’s needed to be placed on a switch on the other side of the cave. However, Glo isn’t able to walk through waterfalls so it means that Bulder has to ensure the path is clear and the main body of water is safe to traverse. As we continue our journey to return Glo to his rightful place and to reunite him with his starry friends, both characters gain abilities that add layers of puzzle-solving elements into the mix at a steady and comfortable pace. We won’t spoil it, but some of the later caves have us scratching our heads for longer than we’d like to admit. There’s very little room for error, and there’s only one way to battle these tasks, but clearing one after exploring every tiny corner of the cave not only provides a welcome sigh of relief but also a real, well-earned sense of achievement. The attention to detail to scenery and even down to the subtle, cute emotes from the characters is truly breathtaking at times and the developer's focus on creating a world that’s inspired by Norweigan art is magnificent and pulled off almost without a hitch. However, the title runs at 30fps and we do experience moments of screen judder and slowdown in some of the more built up cave areas. It should also be noted that Pode is almost unplayable in tabletop mode due to the tiny details that are easy to miss even on a 55-inch TV. 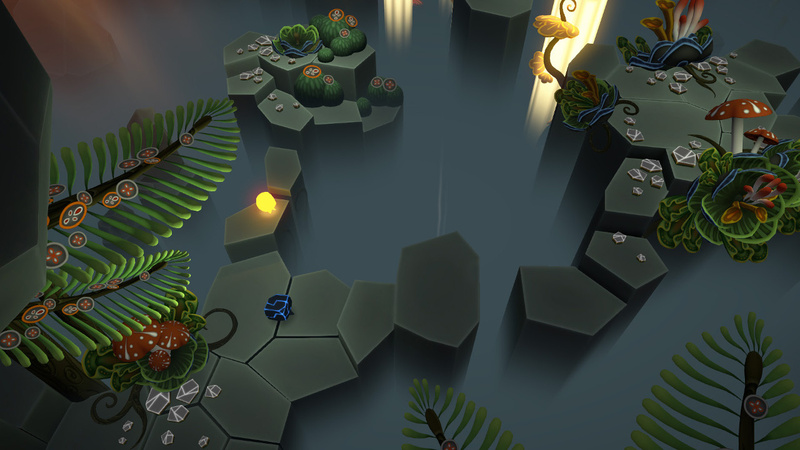 What could have easily been a series of gloomy and uninspiring caves full of puzzles to roam, reveals itself to be a collection of carefully and beautifully designed spaces that makes the exploration aspect of Pode a surprising element that adds to the fun package of puzzle-solving and cooperative gameplay. Each cave places the camera at a different angle and that can sometimes be an issue. Often enough it helps to mix things up, but with no option to pan or shift the view, you’re forced to complete each puzzle from a set perspective. Granted, the perspective floats and follows the main character that’s being controlled, but you’re stuck with what it gives you. We’re not asking for an FPS view here, but having the ability to slightly shift the camera to help with some of the more zoomed out caves could alleviate some of the frustration that comes from finding hard-to-see boxes or hidden ledges. One thing is for certain: having a trusty friend on hand is an absolute must. 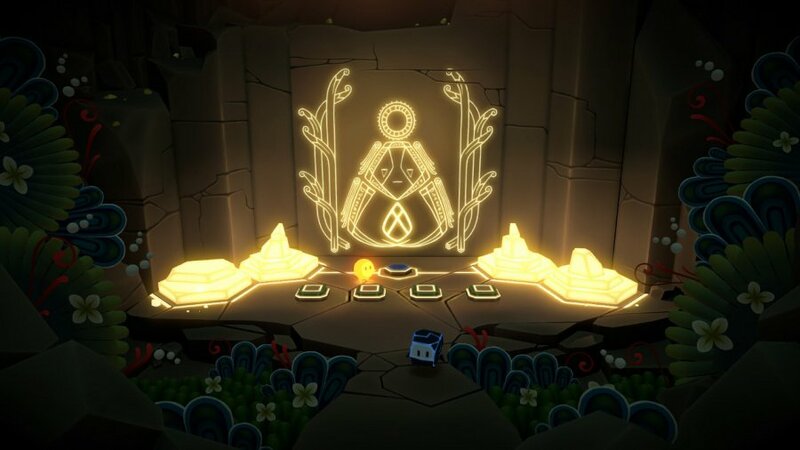 Pode can be undertaken on your own, but we encountered some issues that made grabbing a friend the much-preferred way to play. Not only is it more fun, it’s far more straightforward and less frustrating. You see, playing on your own requires you to constantly flick between both Glo and Bulder, and it soon begins to feel disjointed and a lot of the charm is lost. Play with a friend or loved one and the dynamic instantly changes for the better. Working together and every cave gets cleared more effectively with two minds at work. We found that player two blissfully ignored the glaringly obvious hints while we pick up on them. Our trusty friend, however, often saw the end goal to a puzzle and worked backwards. Splitting off and using their unique abilities to make the cave come to life in an explosion of colour and sound. Meeting in the middle to exchange methods is a real joy and we spend a lot of the time real-life high-fiving. Pode offers a display of unique and striking splendour from the get-go that’s certainly best enjoyed with company by your side. Going at it alone is achievable, but this 3D adventure/puzzler's charm is inadvertently lost when you go solo. Much like the critically acclaimed Journey on PS3, players are treated to a simple, yet incredibly moving story of hardship, friendship and companionship that sheds light on the importance of true teamwork. This looks interesting ,one of my favourite features of the switch is the ability to jump into co op wherever I am so the more games that cater for it the better imo. @Bunkerneath I'd still seriously consider this. Try playing single player with your wife watching and I can guarantee she'll grab a Joycon after 1 hour of backseat game Thanks for reading! I just curious, what are small details that hard to see in Tabletop mode ? This review looks promising. Perhaps I’ll pick it up and play co-op with my wife, assuming the download size isn’t ridiculous. @Anti-Matter A lot of the caves are quite cluttered which isn't so much of an issue on the big screen but when only on the Switch screen, it makes things more difficult to spot. The majority of Pode requires you to stand still and gauge each cave and look out for the smaller details to gain clues on how to proceed, challenging on a smaller screen, unfortunately. Super Chariot has put me off trying to play co-op games alone. I still enjoy it to a point, but when the difficulty spikes towards the end, it becomes more frustrating than fun. I may have to bribe someone to help me complete it. Not many people can play when I can. Great to see co-op coming back a bit, though, and this looks like a quality title. @Richard_Atkinson As @thesilverbrick brought it up, any chance it could be made so file sizes are added to the overview page for games on here? Its definitely a great bit of info to easily access. As for the game, certainly looks and sounds interesting. But am predominantly a solo player so may be a miss until that changes. I've seen the trailer. The game looks really adorable. €25 seems a bit much but I'm sure that it's worth it. The perfect game for my oldest daughter and me. I had a lot of co-op fun with Affordable Space Adventures on Wii U, this sounds like a comparable experience. I'm in. I'm so interested in this! As soon as there is a sale I'm in! @Executer66 damn! You'll find somebody to share your life with, I'm pretty sure of it. I've been playin' this for about a week now and I can tell you while co-op is great, it's just as good solo. The art direction, puzzles and music are great. Don't overlook this Nindie! I thought the switch was all about couch co-op. This review makes it seem as if no such games exist on the console. Beyond that, great review. I'm interested in this game, but its too pricey. I am going to wait for a sale. When I exhaust Snipperclips, maybe. But I'm not sure if I'm even halfway through it. @Executer66 Nintendo’s new Network Service soon to be rolled out means you won’t need any friends! VERY cute looking thing they put together there. @SmaggTheSmug Ooo, did you get the DLC? I'm yet to have a crack at the extra stages myself. @JJ286 Thanks man, I hope your right. Shame it doesn't lend itself to tabletop mode. Would have been nice to play this in flight with my wife on an upcoming trip. ...thought the old lady and I could co-op this, but after a lackluster experience on MK8D, she just won't have any more 2-player games.